Wisconsin 7, Penn State 0: Jonathan Taylor busted through the middle, escaped a tackle attempt and went 71 yards to the end zone with 11:04 left in the first. Penn State 7, Wisconsin 7: The Lions answered on their next possession with a 75-yard TD drive, helped by a pass interference call on the Badgers that converted an early third-and-8. Miles Sanders had a couple of big runs, then Trace McSorley hit Pat Freiermuth for 16 yards to the 14. McSorley found DeAndre Thompkins in the end zone on the next play with 7:41 to go in the first. Penn State 10, Wisconsin 7: Badgers QB Jack Coan fumbled the snap at midfield, and PSU recovered at its 48. The Lions got a couple of first downs to the Wisconsin 26, then got flagged for a key holding penalty. They stalled at the 31, and Jake Pinegar tied his career long with a 49-yard field goal against the wind with 1:53 left in the first. 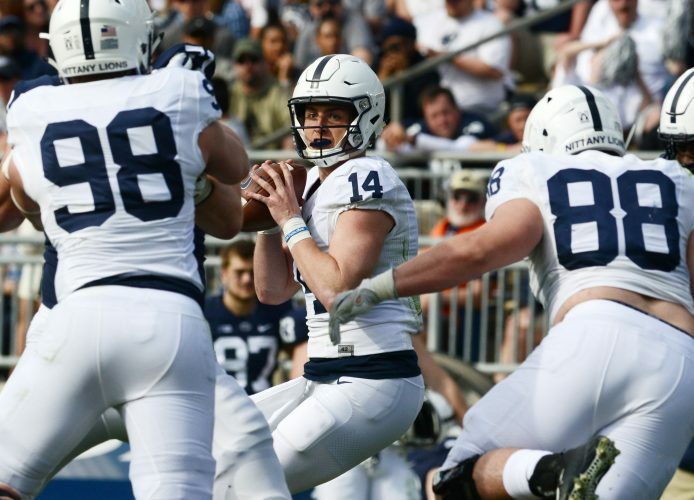 Penn State 16, Wisconsin 7: Sanders had runs of 17 and 23 yards to move PSU into scoring position, then McSorley hit Freiermuth for 14 yards to the 3. Sanders took it over the top from 1 yard out two plays later with 8:09 left in the half, but Jake Pinegar missed the PAT. Penn State 16, Wisconsin 10: The Badgers ran it up the field on the opening drive of the second half, highlighted by a 37-yard gain by Taylor to the PSU 23. They got one more first down to the 13 before stalling at the 10, and Rafael Gaglianone kicked a 28-yard field goal with 9:45 to go in the third. Penn State 19, Wisconsin 10: PSU had fourth-and-1 from its own 36 and ran a fake punt, with up man Johnathan Thomas taking the snap and picking up a yard for the first down. Wisconsin also was flagged for unsportsmanlike conduct, adding on 15 yards. The Lions stayed mostly on the ground with Sanders and McSorley and got to the Wisconsin 23, then Pinegar kicked a 42-yard field goal with 4:07 left in the quarter. Penn State 22, Wisconsin 10: Sanders continued his big day, carrying the offense on a drive that started at the PSU 45, and he had a 12-yard run to the Wisconsin 10. Sanders fumbled on the next carry, but replay showed he was down. The Lions stalled at the 5, and Pinegar kicked a 23-yard field goal with 7:23 to go.